Just when most “Who Dat” fans thought that they’d probably seen everything that’s transpired in the 52-year history of the New Orleans Saints, last night was a moment for them that only comes along perhaps once in a lifetime. For the announced crowd of 73,028 fans at the Mercedes Benz Superdome plus the millions of people watching on from home, it was a night that they’re likely still find unforgettable many years from now. Not only because the soon-to-be 40-year-old future NFL Hall of Famer broke one of the League’s most iconic records, but also because he led (4-1) New Orleans to its fourth straight victory — and helped put the Black and Gold at the very top of the current playoff standings within the NFC, after five games completed and heading into their Bye Week. 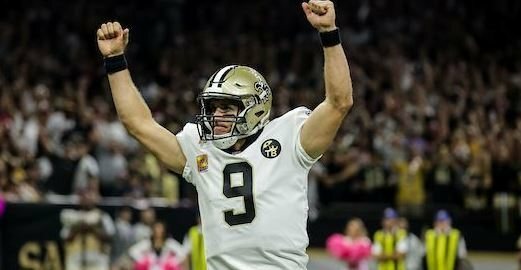 With the eyes of the pro football world upon him, Brees delivered one of the greatest and memorable hallmark performances of his 18-year career last night. He sliced and diced the top-rated but beleaguered Washington Redskins defense to the tune of 363 passing yards in a 43-19 blow-out. 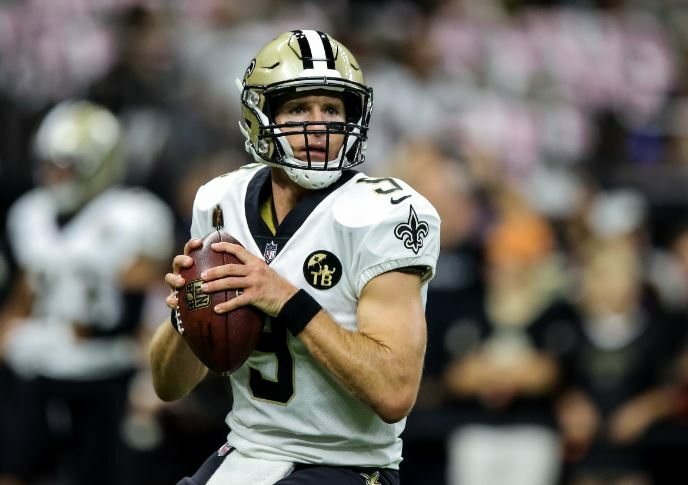 Brees then broke recently retired and former All-Pro quarterback Peyton Manning’s career passing record in spectacular fashion after he hit rookie Tre’Quan Smith on a 62-yard bomb in the 2nd quarter. Brees finished 26 of 29 for 363 yards and three touchdowns. He has yet to throw an interception this season. Smith, the team’s rookie 3rd-round draft choice this past April, caught two touchdown passes from Brees. Smith also added another 35-yard score down the right sideline early in the 3rd quarter. 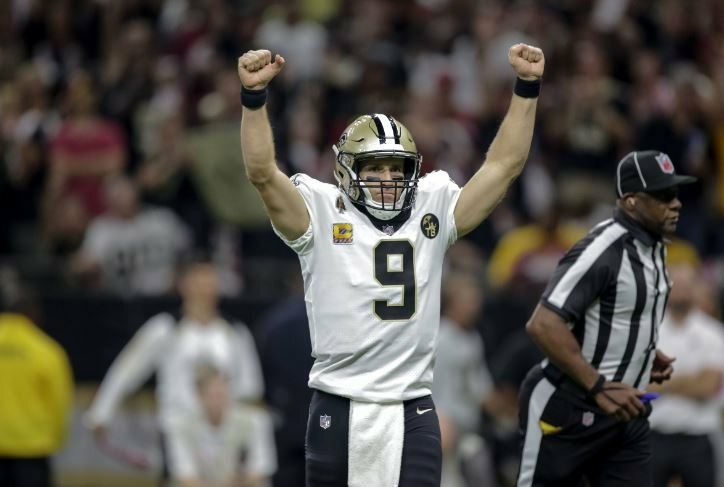 Brees threw as many touchdown passes as he did incompletions (three) and established his own new career mark for accuracy, as he completed 89.7 percent of his passes and recorded the 5th-best QBR (a passer efficiency rating of 153.2) of his entire NFL career. Talk about doing it in style. Brees was an absolute fashion diva on this night. “It’s hard for me to reflect too much right now just because my career’s not done. There are still goals to be accomplished. There are still challenges to be met. And so I’m still very focused on that,” Brees said. “And yet, when something like this happens, there are so many people who are responsible for that, that are a part of that, that makes me happy”. 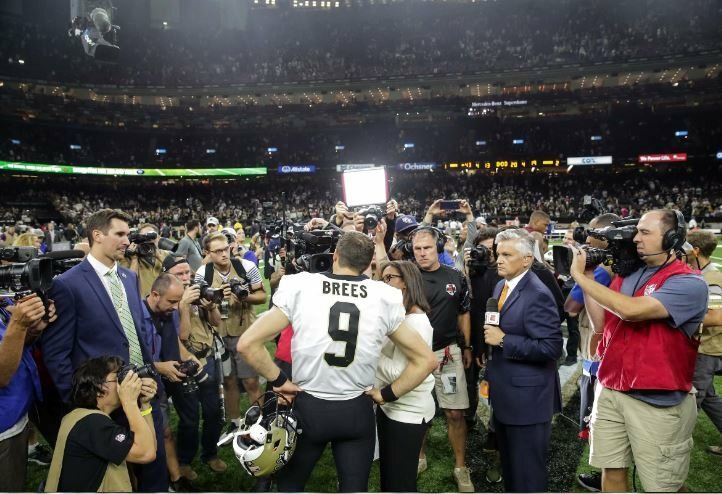 After the record-breaking throw to Tre’Quan, Brees was mobbed by teammates at midfield as they celebrated the moment with each other and the fans in attendance. Minutes later, Brees then met Pro Football Hall of Fame president David Baker on the sideline to present the game ball for display in the NFL Hall of Fame located in Canton, Ohio. 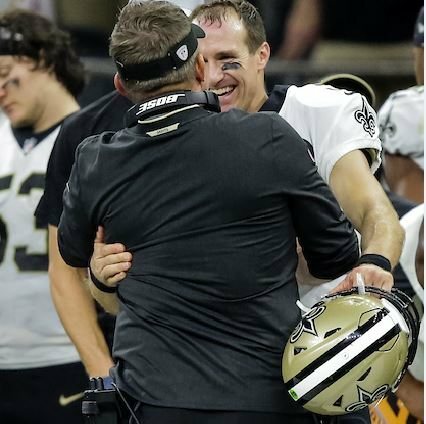 He then shared an emotional moment and a photo with his wife, Brittany, and their four children — sons Baylen, Bowen, and Callen; along with youngest child and daughter Rylen — before he shared a warm hug and embrace with head coach Sean Payton. “It was one of those special nights,” Payton said to reporters in his post-game press conference with reporters. Payton couldn’t be any more right than that. With the win, (4-1) New Orleans now suddenly finds itself on a four-game winning streak, on top of the NFC South Division by a half-game over (3-1) Carolina, and perhaps most importantly of all: the current no. 2 overall Playoff seed in the entire National Football Conference after five games. The undefeated Los Angeles Rams remain as the NFC’s top seed, and will actually face the no. 2 seeded Saints in a few weeks from now (Sunday, November 4) at the Superdome. 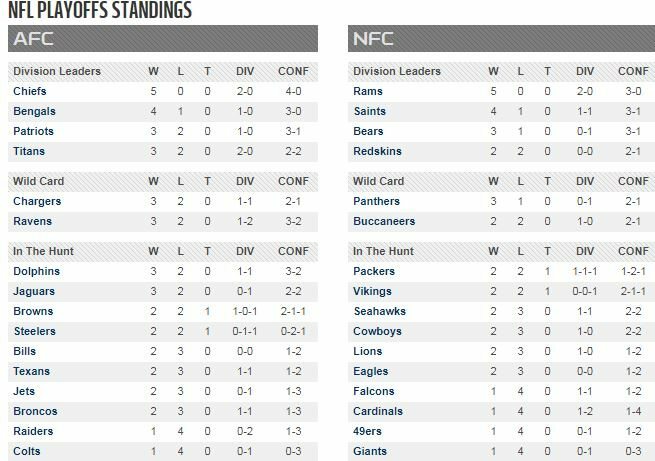 Rounding out the rest of the current NFC Playoff picture, the Chicago Bears are the no. 3 seed and Washington remains at no. 4; while two more NFC South teams — no. 5 seed Carolina and no. 6 seed Tampa Bay — would earn the two remaining Wild Card playoff spots. Obviously, there’s still plenty of football left to be played; and that means anything could happen in the Saints’ remaining 11 regular season games. But to be in this position now where New Orleans finds itself this morning; while taking into consideration just how bad they looked following the embarrassing 48-40 Season Opening loss to the Buccaneers back in Week #1, is quite the accomplishment. Unfortunately for their opponents on this historic night, the Redskins were simply at the wrong place at the wrong time. 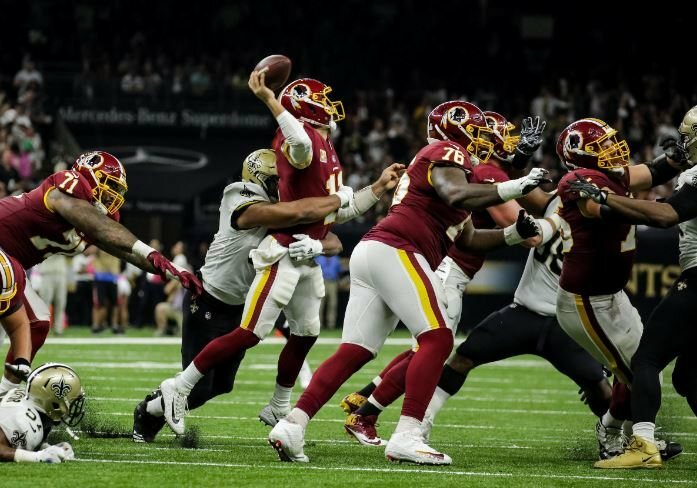 In a manner very similar to the grand re-opening of the Superdome at the start of the 2006 season against the Falcons (forever known as “The Gleason Game” to Saints fans), the Redskins absolutely stood no chance. The Saints scored touchdowns on six of their first seven series and did not punt in a game for only the sixth time in franchise history. But besides Brees breaking records, on this night it was the Saints defense that clearly stood out. They hammered Redskins quarterback Alex Smith all night long, while clearly disrupting his rhythm and timing as they sacked him three times and hit him often (for what seemed to be nearly every single play) in the pocket on plenty of other occasions. Smith ended up completing 23 of 39 passes for 275 yards and an interception. He also rushed twice for seven yards and a touchdown, but lost a fumble as well. 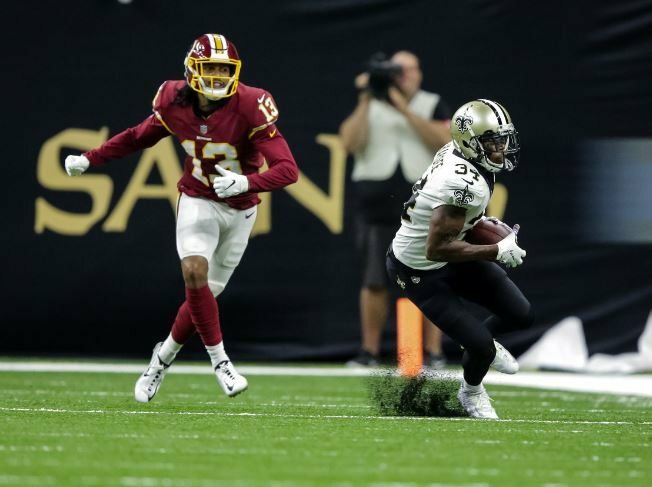 Any hopes that Smith or the Redskins had of making a comeback was then subsequently wiped out when Saints back-up cornerback Justin Hardee, a special teams ace who was in the game because of starting #1 cornerback Marshon Lattimore’s second-quarter concussion, stepped in front of Smith’s poorly underthrown pass at the Saints’ 19-yard line and returned his first career pick to the Washington 4-yard line before he ran out of gas. It was the type of big play on defense that the Saints made often last season during the height of their success, and it’s a great sign going forward for the defensive unit after their notable early-season struggles in the first few games, despite their winning record. Perhaps last night’s solid performance is a harbinger of things still to come for the Saints defense. It certainly was a reason to celebrate, and celebrate is exactly what most of the Saints fans from among the 73,028 persons in attendance would do on this night. What a story that will be. “It was a privilege to be here tonight because this was history,” Baker said. Excellent is what Brees has been ever since his arrival in New Orleans over 12 years ago now. And excellent is how he will remain, many years after his brilliant NFL career is over. Brees will now get to enter the Week #6 Bye Week as the League’s undisputed leader in passing efficiency (122.3) and completion percentage (77.9). In 190 pass attempts, he has thrown 11 touchdown passes and has yet to throw an interception. That’s a staggering and potentially mind-blowing statistic for a man who is allegedly “declining” and supposedly near the end of his playing years. Those numbers, however, would seemingly render any such future observations (at least for this season anyway) as obsolete. What a season it’s been for Brees thus far. 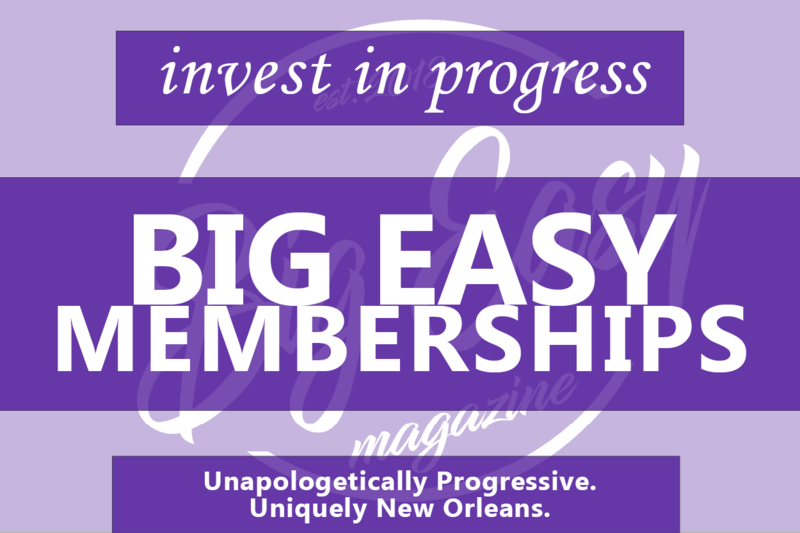 Editor’s Note: If you enjoy Barry’s writing, be sure to check out his detailed story on the how the Saints continually leave their indelible imprint on the New Orleans community and culture! Monday night had to be one of the truly memorable nights in Saints history. Not only did Brees and the team deliver a first class performance, Brees crushed the passing record in front of a national audience with plenty of room to spare! For Saints fans, last night will go down as one of our proudest moments. I’m old enough to remember when we were “Aints”. We ain’t no more, ever since Drew Brees and Sean Payton arrived. Bless these guys and what they’ve given to New Orleans.